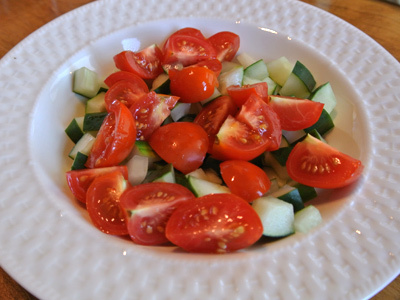 Here’s a little cucumber salad I tossed together with some leftover cucumber and tomatoes to go with our Dan Dan Noodles. 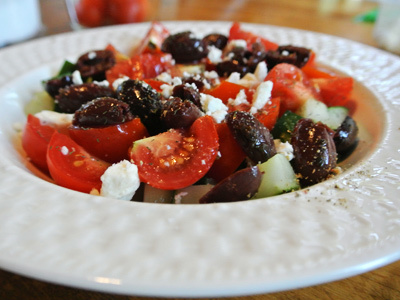 I went a little bit Greek with the addition of Kalamata olives and Feta cheese. Going for simple, I added a splash of lemon juice and lemon infused olive oil to top it off. 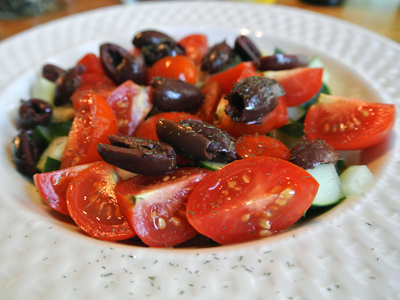 It was the perfect little side salad that tasted fresh and crisp alongside our meal. 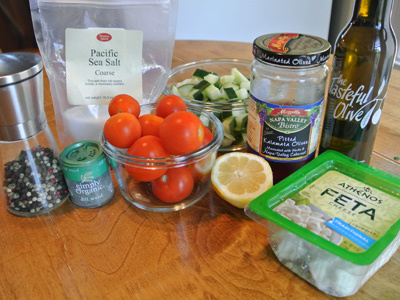 I started with a leftover cucumber, added a carton of cherry tomatoes, some katamala olives, and some feta cheese. I seasoned it with salt, pepper, dill weed, lemon juice and lemon infused olive oil. But if you don’t have lemon olive oil, extra virgin olive oil will work fine. I started a layer of cucumber and tomato. Slice about 1/4 cup of katamala olives. Sprinkle dill weed, about 1/2 teaspoon and salt and pepper to taste. Spritz lemon juice over top, maybe a teaspoon or two worth. And drizzle with olive oil. 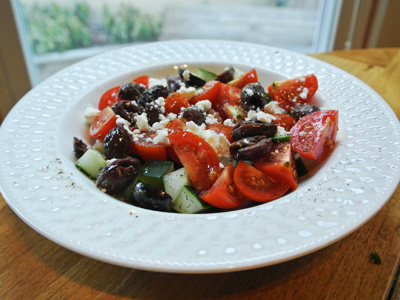 In a medium sized bowl, layer your salad with diced cucumber, sliced tomatoes, katamala olives, and feta cheese. Sprinkle dill and salt and pepper to taste. Spritz lemon juice and drizzle olive oil over top.